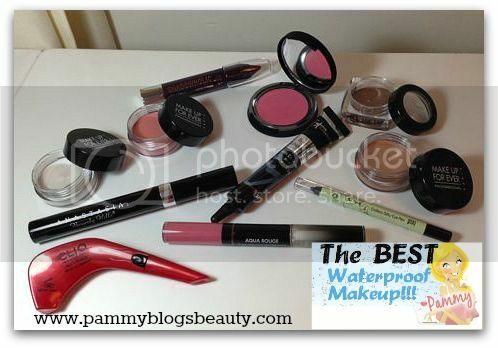 Pammy Blogs Beauty: Makeup Wars: The Best Waterproof Makeup! 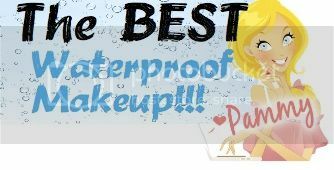 Makeup Wars: The Best Waterproof Makeup! It is Makeup Wars time again!!! As the Makeup Wars bloggers gear up for Summer, we want to share our picks for the Best Waterproof Makeup items! I don't know about ya'll, but I absolutely live at the Pool during the Summer. Plus, we usually hit the beach every Summer. Only the best waterproof makeup will survive on the beach or during pool-time! No, I do not do a full face of makeup when spending time at the beach or in the pool. However, I do want the makeup that I apply to stay put. Also, even when I am not at the beach or pool, I find that good waterproof makeup works the best in the GA heat and humidity for everyday in the Summer. So, these waterproof choices are great for anyone wanting pool-proof makeup or anyone just wanting makeup that will last all day in the heat without budging! Before diving into my picks for Best Waterproof Makeup, let me tell you a little bit about Makeup Wars. The Makeup Wars Bloggers are a group of top beauty bloggers that publish coordinated bi-weekly posts. The Makeup Wars bloggers collectively pick topics to blog about (e.g., Top 10 Products, Beauty Pampering, etc). We publish our posts at precisely the same time and link up through the graphics at the top and bottom of our posts. It is always so much fun to see what products this group of top bloggers is using and loving. During the Summers I tend to go a bit "lighter" with my makeup. I usually skip foundation and just stick with some eyeliner, mascara, lip color, blush, and (of course) some under eye concealer. Plus, of course I want these items to have amazing staying power. To find out my choices for Best Waterproof Makeup, please click "read more" below! Just go ahead and throw away any pre- conceived notions of long-wearing lipstick. I, too, have tired long wearing lipstick in the past that was so drying that I couldn't even stand the feel of it on my lips. However, this is absolutely NOT the case with Make Up For Ever's Aqua Rouge!!! Somehow, they were able to create a budge-free formula that feels comfortable on this lips and does not dry you out terribly! I am pretty amazed at the performance, look, and feel of this super long-wearing lippie!!! It gives the intensity and longevity of a lip stain/lipstick hybrid with the shine of a gloss. These are 2-part long wearing lipcolors: One end of the tube is your lip color and the other end is a clear and super shiny gloss. I tried out the color Pink #15 which is an opaque medium bright pink matte pink (that becomes super shiny with the gloss on top). I am completely amazed with the long-wearing quality of this lippie! It lasted well through all morning, lunch, and most of the afternoon with only gloss reapplication. Even when most of the color wore off, you still have a bit of a "stain". I adore this lip color!!! Aqua Rouge lipsticks come in 12 shades and retail for $24 each at Sephora. 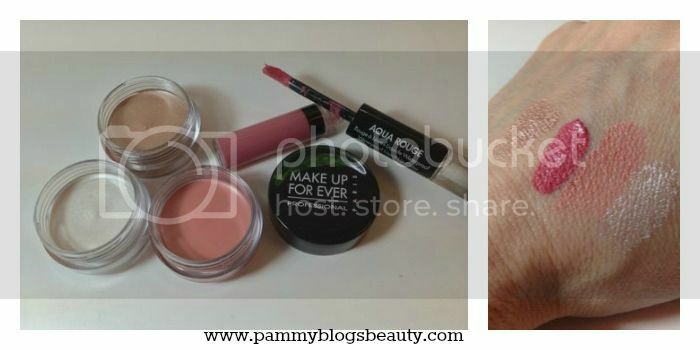 Make Up For Ever Aqua Cream: For Eyes and Cheeks (and Lips, too! ): Smudge-proof, Crease-proof, tear-proof, and waterproof!!! Available in 26 shades for $23 each. When I think "waterproof makeup", these Aqua Creams from Makeup Forever are honestly the first products to pop into my head. These are hands-down amazeballs. I have the eye color shades #04 Snow and #13 Warm Beige. These two are my current go-to cream shadows for everyday wear. I just swipe a bit across the lid for a wash of color and I am good-to-go. Actually, I like Snow in the inner corner and Warm Beige across the rest of the lid. So easy!!! Plus, they wear all day and are waterproof!!! These are great for "pool and beach" makeup as they give you just a hint of makeup without you looking too overdone. Plus, I find that these particular shades do double duty as they cancel out and cover any eyelid redness. The Lips & Cheeks Aqua Cream shades for Lips & Cheeks are exclusively sold at Make Up For Ever Boutiques. Let me tell you, these are *totally* worth a special order!!! I have shade #05 which is a universally flattering soft and slightly shimmery peachy pink. A little dab of this on your cheeks and lips brings such great color to your natural pool/beachy look...or, of course, a great color for a long-wearing cheek color for everyday! :) As a cream blush fanatic, I am becoming a bit obsessed with this blush!!! I consider it a Summer Must-Have! Looking for a great long-wearing waterproof cream shadow, but Make Up For Ever is not in your budget? Try these bad-boys from Hard Candy at only $5 each (at Walmart!). Just swipe them on with your fingers for a good 6-8 hours of wear. These do slightly crease on me after a few hours. However, they are really great for the price! I have the shade Quick Sand which is so easy to wear. The perfect coppery taupe neutral! If you have not scoped out Hard Candy at Walmart, you are missin' out! Hard Candy is really the only reason I ever venture into a Walmart, lol! Here is another great option from Hard Candy! The Shadowholic Eye Crayon! These are super chubby long-wearing pencils. They are quick and easy to apply and really don't budge. I have the shade after hours which is a somewhat sheer and slightly shimmery purple color. I am not sure if all of the shades are this sheer or if it is just this one color. They come with a sharpener and are an absolute steal for $5 each! Does your mascara always smudge? I struggle with this constantly!!! Either I have to stick to my HG Cover Girl Lash Blast (which never runs nor smudges on me) or I can apply Anastasia Beverly Hill's amazing Lash Genius! It is basically a waterproof top coat that can apply over any mascara. The name says it all...Genius!!! Interested in my full review? Check it out here: Anastasia's Lash Genius. I absolutely adore the Pixi Endless Silky Eye Pencils! I have a few shades and reach for these often. They are a snap to apply and don't budge all day (and are, of course, waterproof as well). If you like the look of a gel liner and the ease of a pencil, then you must check these out! They lay down such deep and rich dark pigment for the perfect line. Love, love, love these!!! Here is my review for these Pixi Endless Silky Eye Pencils. Have you discovered IT Cosmetics yet? It is quickly becoming one of my all-time favorite makeup brands! Many of their products are waterproof including this amazing Vitality Cheek Flush Blush Stain. I won't go into too much detail here as the full review is coming soon !!! Let me just say that the color is beautiful and it lasts all day! It is a powder brush that wears like a "stain". Just beautiful!!! The one makeup item that I absolutely NEVER go without is under eye concealer. Even when at the pool or beach! My dark circles are *so bad*. Actually, one of the reasons that I fell in love with makeup was the fact that I could eliminate my dark circles with good concealer. It Cosmetic's Bye Bye Undereye Concealer is easily one of my top 5 concealers of all time. Seriously, it is that good: amazing color match for my very fair skin, opaque coverage, highly pigmented, doesn't cake, and...it is waterproof! This product is so pigmented that you only need a tiny amount for full coverage. This is great for the under eye area as you do not want to cake a lot of product on your delicate under eye skin. I wont say any more as my full review is coming soon!!! So, those are my current picks for the Best Waterproof Makeup! I would love to hear about what waterproof makeup you love! Plus, be sure to click on the thumbnails below to check out what my fellow Makeup Wars divas are loving for Waterproof Makeup! Yay! Another Lash Genius. I had no idea that By Bye Under Eye Coverup was waterproof. It is one of my favorite concealers. I better check that out a bit more this summer. I totally forgot about my IT Products, they are so amazing too. Decisions, decisions! Those Pixi liners are AMAZING! I am addicted to them. Lash Genius is fabulous. Great choices! Make Up For Ever is really the go to company for waterproof products! Thanks for sharing these awesome products! You've got some really great choices! I like the It Cosmetics concealer. @Brooke-MUFE really leads the pack with w/p m/u! 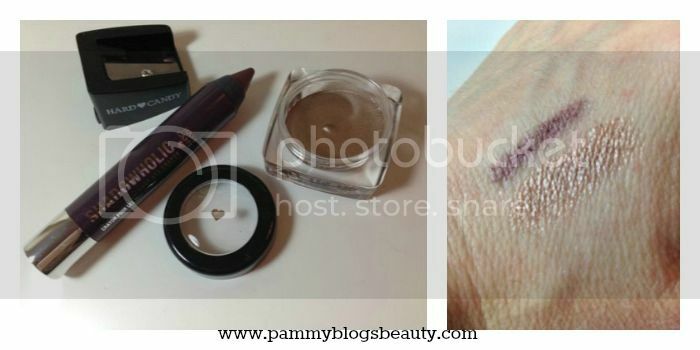 @oldergirlbeauty-Yes, those Pixi liners are sooo good! They apply so easily. Love! @PrimeBeauty-Yes, love that lash genius! You win in having the most unusual brands since we all mostly stuck with MUFE, Anastasia and tarte. I love my It Cosmetics Bye Bye Under Eye but didn't think of it as waterproof. Great suggestion. MUFE is the big winner in this one! @Marcia-Thanks lady!!! :) Yes, it Cosmetics really does have a nice waterproof assortment. I also had no idea that the IT concealer is waterproof and I wear it all the time! I haven't tried it in water. That red liner thing looks great too! I think I am the only one who has not tried the Lash Genius! I need it now!